Matthew tries to get Lee to lie down with him (they are squatting in No.30) but she pushes him away, telling him to leave her alone. Matt tries to get Lee to talk to him, but she won't - she just says that she's not ready. She feels confused because things are happening so fast. Matt is upset and accuses Lee of not being serious about their relationship. Lee says she feels stupid - she does love Matt and he's the only one she's let get close to her in a long time. Matt promises not to pressure her, but he rolls his eyes quietly. Ryan and Sharon are doing their homework. Ryan raves on about Kirsten but tells Sharon she was wrong - Kirsten doesn't know anything about surfing(!) Nick hasn't got a date for the dance and Ryan suggests he takes Sharon. Sharon says she's already got a date, but she won't tell them who it is. Nick is just leaving for school. Jim updates Helen on what's happened with the Todd trail bike situation and that things are very tense around the house at the moment. 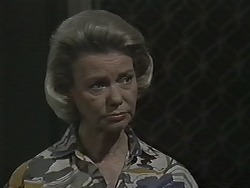 Helen is concerned - Madge and Harold will be back in a few weeks, and she doesn't want to move back to the Robinson house if Jim and Beverly are still fighting. Nick rushes in, saying he's seen a curtain move at No.30. Jim decides to call the police. 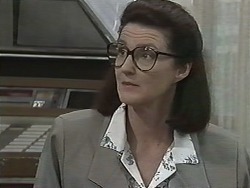 Melanie has come in to rave about Gloria's great catering last week. He says that Des has arranged another catering job for her for today. Gloria is speechless. Jim and Matt are chatting again. Jim mentions that Nick saw a curtain move at No.30 this morning - but when he went to look there was no-one there. Matt is very relieved. Just then, a woman drives up in a battered old car. DOROTHY:(about the car) One of us will have to go! She asks Jim to have a quick look at the car to get it back on the road. She tells Jim bossily that she'll be back in half an hour. Jim is speechless! JIM: I have no idea! Gloria is panicking about the catering while Lee looks for a new place for her and Matt to live. Matt comes in looking for Lee. GLORIA: Lee's been telling me about your little problem. GLORIA: Don't get too upset about it - just keep on trying! Luckily Matt realises Gloria is talking about finding a flat(!) Matt tells Lee that Jim sent the police round to No.30 this morning - he'll have to go and get their stuff at lunchtime. Ryan apologises for putting his foot in it with Nick and Sharon. Nick says it's fine - he and Sharon are ancient history, but Sharon is "stuck on" Ryan. Ryan is surprised to hear this. RYAN: Oh no. How could I be so stupid? He feels bad for upsetting her with the Kirsten business. Nick says that Sharon will get over it. Matt sees Melanie and the police outside No.30. Melanie calls out to Matt that the police are keeping an eye on the place in case of burglars. Lee is managing the lunchtime rush while Gloria finishes off the outside catering. She thinks she's getting the hang of French cooking - it's not so much what you make, but what you call it(!). She tells Lee to find out what the Coffee Shop customers think of her French recipes. 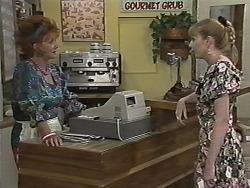 Dorothy is in the Coffee Shop and has ordered one of Gloria's dishes. She tells Lee that the soup is awful. But she says she may be over-critical, having had the real thing in France. She orders a coffee instead. LEE: Er...she said it reminded her of her time in France. Jim comes over with a letter for Nick from the Arts Scholarship people in London. Nick gives the letter to Helen to open. HELEN: Oh, Nick. I'm sorry to say that...better pack your bags you're on your way to London on a scholarship! They are all very excited and jump about. Sharon is trying on some dresses for the school dance. They are horrible(!) Helen asks who Sharon's new date is and she says it's Marc Devereux. This is obviously a lie. 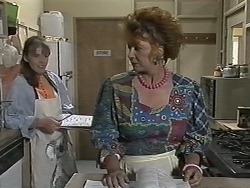 Gloria has come to see Des for his verdict on the catered lunch. Melanie winds her up at first, but it turns out that they all liked the lunch very much. MELANIE: It was me that blew it. MELANIE: Well, I got the message wrong. It seems they only really wanted andwiches and a salad. 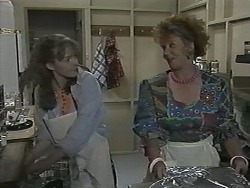 Melanie apologises that Gloria went to a lot of trouble for nothing. Matt and Lee have sneaked back to get their stuff by candlelight(!) They don't know where they're going to go though. Lee thinks they should risk staying at No.30 for another couple of nights. She suggests Matt could go back to the Robinsons, but he wants to stay with Lee. Matt finally relents and says they can stay at No.30 for a couple of days - but they have to be very careful. Ryan tells Helen about the Sharon/Kirsten thing. Helen says Ryan will have to talk to Sharon about it. He isn't looking forward to it.